Mak Plus Power Systems creates frequency converters conv-mak series 320 kW / 400 kVA in Germany or Europe. 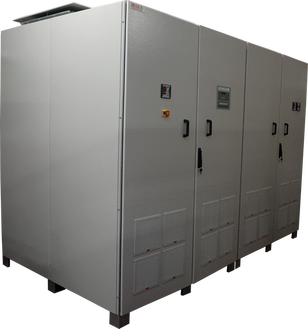 The 400 kVA frequency converter solutions are IGBT used, transformerless or on build additional isolation transformer as a result of high-tech, newest technology used advanced designed converters can be used in military services, refineries, sea ports, air ports, navigation systems, power plants. Mak Plus Power Systems, 400 kVA frequency converter is true on-line double conversion design frequency converter systems, manufactured with the state of the art, PWM and IGBT technology, producing microprocessor and DSP micro chip controlled pure sine wave output converters. Mak Plus Power Systems CONV-MAK series 400 kVA frequency converters protects and supplies 50Hz - 60Hz input and 50Hz - 60H - 83Hz - 400Hz output frequency systems such as data centers, networks, communication systems, medical devices, measurement devices and offices with a technical details of Engineering Purposes as well. We have references with our high efficient frequency converters in NATO armies, telecom sector, railways solutions...etc in Germany. AC/ AC The frequency converter 400 kVA is important for all around the world. 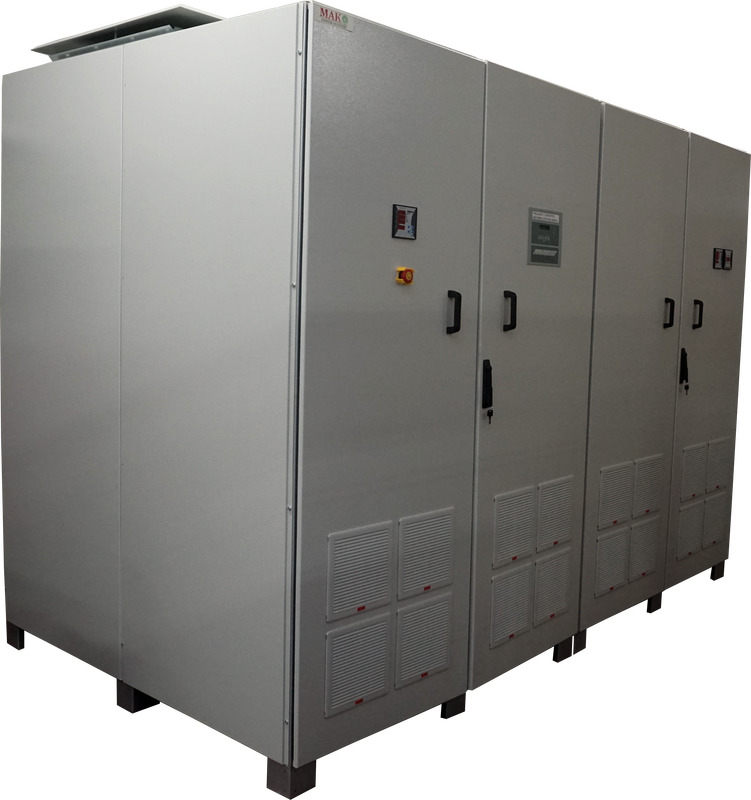 The cabinets for the 400 kVA frequency converters are IP20, IP22, IP23, IP32, IP44, IP54, IP55 and the client oriented customizable frequency converter solutions for our your need as 400 kVA produced less than in 4 weeks. We also design 400 kVA frequency converters and conditioners for your laboratory and test equipments as well. The frequency converter has been designed and produced in Germany. We also design 400kVA frequency converters and conditioners for your laboratory and test equipments as well. The frequency converter has been designed and produced in Germany. We produce the 400 kVA solutions only in some weeks for your need. And ready to supply with BV certification in some weeks. Power range of 400 kVA frequency converter for or harbors are produced with the newest industrial edition requires not so much to serve sustainable.So tthe connection can be done via RS232 or USB or to the monitored Smart frequency converter equipment. It provides UPS management and safe server shutdown for up to 25 servers.UPS Network Management Cards made by APC are enabling UPS management, by directly connecting the UPS to the network with its own IP address, avoiding dependence or the need for a server, what is particularly useful in wiring closets where frequently no servers are present. PowerChute Network Shutdown, together with the UPS Network Management Card, enables safe server shutdown by communicating over a network to any network-enabled APC Smart-UPS those that contain an converter network management card). Static 400 kVA frequency converters used with the all parts which cannot adapt to line frequency power. Static frequency converters produced economic and more technologically by having solution oriented design so than the dynamic converters for these problems. The converters efficiency is higher, and operation costs are lower and from Germany. Frequency converters dynamic response is very short, because of working with static components. They are DSP controlled and they can be developed according to customer needs. Battery can be added to system and converter can continue to work even in line failures.